A MOSS extension, complete with garden landscaping and interior design – a multidisciplinary project. Liaising with endless contractors for a project can be daunting and difficult and many clients have talked about the ease of working with one company who they can trust. This couple’s attention was caught by the fact that we undertake the whole project contract, including groundworks and they were pleased to find that our holistic approach to design and construction made the whole process easier. Our designers and builders know every aspect of a project and we have the skills and knowledge to adapt well to many scenarios. The couple’s home extension in a quaint village near Bath required many bespoke features including garden landscaping and interior design. Our clients’ pod began life as an extra bedroom to accommodate extended family, but after looking at various designs, the couple soon realised that the quality and luxury character of the MOSSpod meant that it was going to be the best room in the house and so it became their main living room. It is now the crowning glory of the property, freeing up the current living room to become the family dining area and children’s playroom. Our clients were conscious not to exceed the ceiling price of the house, with the total amount they wanted to spend on the property, but they also didn’t want to skimp on quality and finish: they wanted something luxury and beautiful and as a pre-designed product, our pods were ideal to fit their budget. They went for a Park Range MOSSpod, using the best natural materials with deluxe finishes and we pulled out all the stops. Even though the property is on the border of a conservation area, we achieved planning permission easily and since its construction, our clients have said that ‘the building has both met and surpassed our expectations’, from the interior design to the way it sits within our newly landscaped gardens. 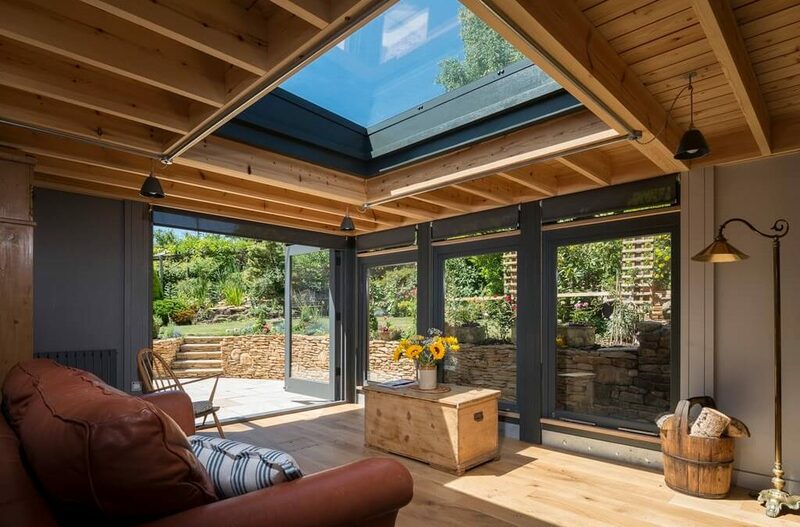 They particularly love a magnificent roof light in the centre of their home extension: a sun trap creating a bright living area and a view to the stars in the evenings. The oak flooring compliments the sliver larch joinery of the ceiling and pod exterior and a hidden sliding glass door leading to the rest of the house creates an elegant space which is kept cosy by a stunning wood burner. Exterior lighting makes soft pools of light so that the MOSS landscaped garden, stone patio, light ochre stone walls and raised flowerbeds, can be enjoyed even when the sun goes down. The landscaped area catches the sun wonderfully, making it a perfect place to relax and dine. Our MOSS carpenters even handcrafted a stunning Douglas Fir loggia, which compliments the exterior design. 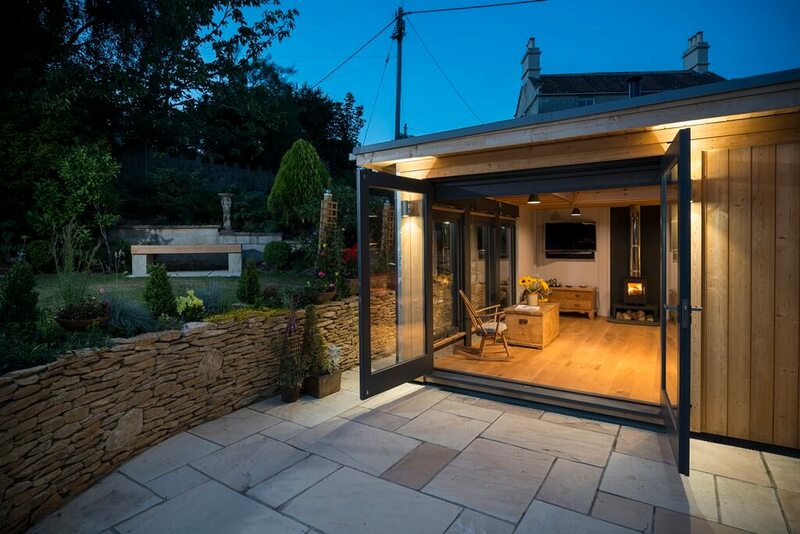 Our clients are so delighted with their new pod that we are now transforming the front of their house with a bespoke extension, safe in the knowledge that we complete our work ‘to the highest standards’. The client’s experience is our top priority; it should be as exciting, stress-free and smooth as possible!